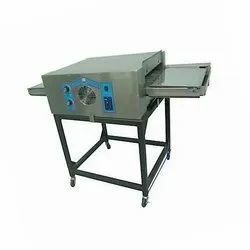 Our product range includes a wide range of electric pizza oven, ss electric conveyor pizza oven, electric conveyor pizza oven, pizza make line and gas conveyor pizza oven. 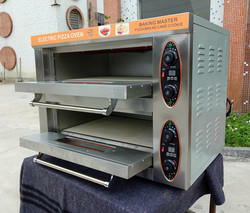 Deck Pizza Oven, stone based pizza oven, electric pizza oven. Fast heating, baking evenly with lava ceramic stone. 2. Fast heating, baking evenly, very economic. 3. With timer, see picture. 5. Wide range: bread, cake, pizza, cookie, etc. It is suitable for bakeries, restaurant, snack bar, etc. 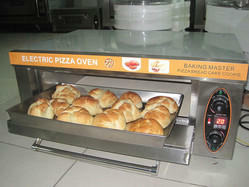 This is a brand new conveyor pizza oven that can cook up to 20 pizzas per hour. Power: 415V, 8.4kW Three Phase. Ambience Temperature 43 Deg. Cel. We are the manufacturer and supplier of Best Quality Pizza Make Line. 3. Temperature control from 50 to 400 degree Celsius. 4. Output: 30-50 pizza per hour. 5. 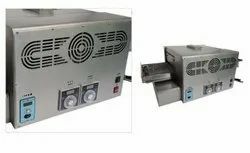 The Oven body is made of stainless steel sheet and conveyor belt made of stainless steel 304. 7. Pizza size: Max 18 inches. 8. 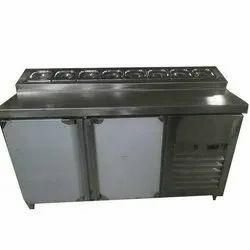 Food ranges: Professional for pizza kitchen commercial, also can be used for chicken wing, fish, bread, egg tart, etc.